leaving me weeping, with so much still to say. or sing what I, in silence, had picked up from you. Sing as we walk—it makes the trip less painful. It’s true for bees as it is for human beings. Centos are like a quilt, my mentor told me—you find the used fabric in other people’s poems and then you stitch it together to make it new. The lines I gathered here from various Virgil works have different weaves and textures from their various translators. Yet when stitched together, the fragments form a new whole—much the way a wound might heal when stitched together, with new implications forming an interconnective tissue that bridges the pieces that have been brought together. Little is known about the actual life of the Roman poet, but his work bears witness to much war and destruction of the land; some of it in an apocalyptic tone. There’s much in the world and its current climate that feels that way to me right now. The tenuous existence of bees, the busy pollinators who do so much to hold our food system together, often seems a portent to me. Who knows if they buzz to comfort one another? I know that as long as I can hear that buzz, it will be a comfort to me. A sign that not all is lost—a sound that tells me there are still enough scraps left to stitch together a new whole, to begin to heal this planet. lonely. And when the sun burns again, say we. This poem came from a conversation with a friend. We were both mourning the disintegration of “us,” how isolated and selfish much of our civic and personal discourse had become. Our inability to value or even acknowledge others, as a society, seems to go hand in hand with our inability to value or even acknowledge the environment around us or the damage we seem so willing to do to it. When I came across Issa’s haiku, the interspecies empathy radiated off the page and I immediately wanted to dialog with the poem. How had we lost our capacity for empathy with each other as humans, never mind our empathy with the “fleas”? The form is one I believe Richard Garcia made up, something he calls a “haiku acrostic.” Each word of the original haiku becomes the first word of the line down the left hand margin. As I wrote, I used the new poem to dig into my question. In a world of isolated “I’s” taking their pain out on the world around them, I believe that Issa’s empathy holds a beginning toward healing—both for humans and the world around them. It starts with the realization that in the “slow sentence” we’re under as a planet, humans and non-humans are in this together. 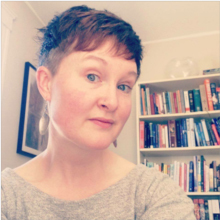 Erica Charis-Molling is a creative writing instructor for Berklee Online and was the Eco-Justice Anthology Support Intern for Split This Rock. Her writing has been published in Crab Fat, Broad!, Anchor, Vinyl, Entropy, Mezzo Cammin, and Apricity. An alum of the Bread Loaf Writers’ Conference, she is currently pursuing her M.F.A. in Creative Writing at Antioch University. More of her work, both published and performed, can be found on her blog: lettheceleryrot.wordpress.com.